Water damage in a business building can seem like a daunting problem to correct, but with the help of KIWI’s Denver commercial water damage restoration services, your business can be back in working order in no time. Our professional commercial water damage services will leave your business looking and feeling brand new in no time. Restoring the integrity of your business’ building after water damage strikes is KIWI’s specialty. KIWI offers a one-year guarantee on all commercial water damage restoration, as well as a one-year carpet cleaning warranty for any carpet work done. KIWI wants to make sure the cost of commercial water damage repairs don’t get out of control, which is why we offer to work with your insurance on top of budget-friendly services. KIWI keeps cost reasonable while providing the best in commercial water damage services. 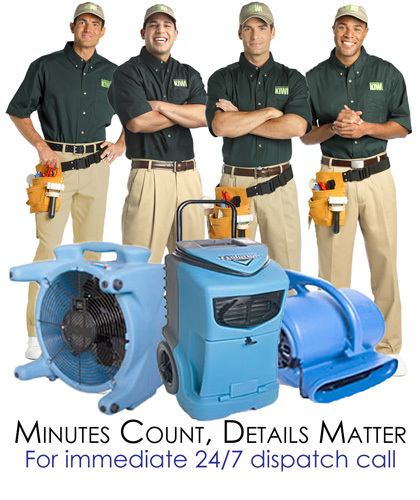 KIWI offers 24/7 commercial water damage repairs, meaning if you need a team to come out at 4 in the morning, we will be there as soon as possible. We are able to work during business afterhours to prevent interfering with business operations. Give KIWI a call right away if you are experiencing water damage. We know the importance of timely repairs when it comes to water damage and your business, so we will waste no time in getting to work.